KS PERMAGLIDE® plain bearing bushes are available as a standard product with inside diameters of up to 100 mm or 300 mm depending on the material. Plain bearing bushes with a larger diameter are manufactured from rolled sheet metal as special production. The plain bearings are manufactured in any intermediate sizes from 80 to 600 mm depending on your requirements. Sheets of different KS PERMAGLIDE® materials are processed to create thinwalled large bushes with low space requirements. 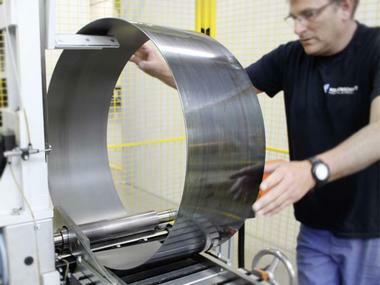 The sheet sections are shaped into plain bearing bushes on roller bending machines. The nominal wall thickness of the KS PERMAGLIDE® sheets is usually 2.5 mm. The sheets are up to 236 mm wide. The sliding-surface coated sheet material is available as coilware. This means that the length of the sheets and the diameter of the bushes produced are variable. The circumference of a cylindrical plain bearing with a diameter of over 120 mm is measured with a precision tape measure in accordance with ISO 3547. To comply with the permitted concentricity, the plain bearing is measured in several levels. The second important dimension for determining the bearing dimensions is the wall thickness, which is measured point by point with a gauge micrometer. Due to the manufacturing process, rolled bushes have a joint. The bushes are also produced with a press-in excess to the locating hole. The press-in excess is measured depending on the diameter and is several 1/10 mm. This means that the bush its closely against the locating hole in the press it and the joint is closed completely. When pressed in this way, the bushes are secured against moving both radially and axially and provide deined sliding surfaces. Mounting a large bush is a challenge. Suitable press-it tools are not always available, as they are expensive to buy in extremely large dimensions or cause diiculties with handling. An easy method for mounting on-site is shrinking the bush with liquid nitrogen. The plain bearing is covered completely with liquid nitrogen LN2 in a receptacle. With its slim structure, the plain bearing takes on a temperature of –196 °C in just a few seconds. This reduces the volume of the plain bearing. A joint clearance to the locating hole in the millimetre range is created. This enables the plain bearing to be pressed in easily. When the plain bearing is in position, it takes on the ambient heat, expands and returns to its original form, thus forming a stable press it. Can be labelled on request with your drawing number, item no., etc.